This map of London was produced for the 1832 Reform Bill that established the metropolitan boroughs. The map's title features along the top, with a compass star at top right, an explanatory note at bottom right. At bottom left is a list of the 'liberties' of the city - the name given to areas exempt from the jurisdiction of the country sheriff, being subject to a separate commission of the peace (in this case royal and governmental authorities). 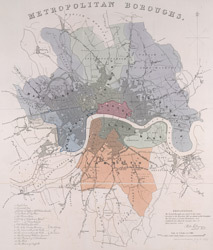 The new boroughs are highlighted in colour, with the shaded area representing the old boundaries of London, Westminster and Southwark.